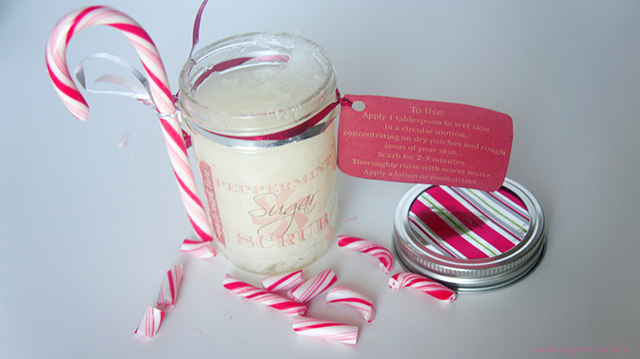 Sugar scrubs make a perfect homemade gift and what scent reflects the Holidays better than Peppermint. I love making DIY sugar scrubs all year long because they are so easy to make, work great and are inexpensive. In a few simple steps you can make your own Homemade Peppermint Sugar Scrub with ingredients you probably have on hand already! Plus, I have shared a free printable label! Simple to make sugar scurb with peppermint essential oil. Smells so good and works great too! In a medium size bowl combine all ingredients until well combined. Fill container/jar with lid about 3/4 full. Tie a cute ribbon and add printable label & tag to the jar. This recipe makes enough to fill an 8oz jar. I created cute and simple labels and an instruction tag to add to your jars to make a simple Christmas gift. Each page has 8 tags/labels per page. Just print the label, cut out and place it on the jar. Print them on sticker paper or cardstock paper’ then tape, glue or tie them to the jar. Also, the instruction tag can be placed on the jar or punch a hole and add it to a ribbon around the jar. To decorate the jars I used stripped wrapping paper under the lid, tied a ribbon around the jar and added a candy-cane! I am going to have to make several of these. I have everything here except the vitamin e oil too. This sounds amazing! I think I’ll make some for my grandson’s daycare teachers for Christmas gifts. I cannot wait to try this with my daughters. We have some birthdays coming up and Valentines day is right around the corner. Yummo!! This sounds like it smells amazing!! I love that its homemade and would make a great gift!! Thank you, Thank you, Thank you!!! I’m really enjoying your printables! Gina, Thanks for letting me know about the typo. It has been corrected. Thanks again! What is the label number so I can purchase the labels to print on? I see they are Avery Dennison but do not know which 2×3 label “model” to choose. Thanks!